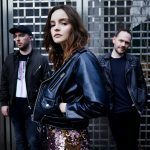 For one exhilarating night only, Scottish synth-pop trio CHVRCHES will bring their fiery, euphoric music to the Concert Hall for their Sydney Opera House debut on Monday January 7, 2019. 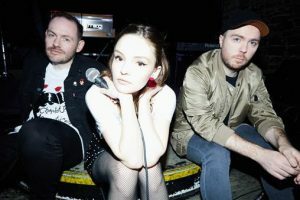 Since the band’s inception in 2011, lead singer Lauren Mayberry and band members Iain Cook and Martin Doherty have established themselves as a powerful live act. Perfectly blending glittery electro-synth with sonic force, the trio have become a staple in the global festival circuit playing Coachella, Glastonbury and Bonnaroo between world tours. Renowned for producing massive dance anthems that you can cry to, their breakthrough success arrived with two self-produced albums The Bones of What You Believe (2013) and Every Open Eye (2015), followed by their most striking and accessible album yet, Love Is Dead. Embodying the band’s signature cathartic pop formula but with a darker twist, Love Is Dead responds to the volatile and uncertain political and social state of the world whilst simultaneously reflecting their ideology and music ambitions. In their adoptive hometown of New York City, the band shifted their creative process by enlisting powerhouse producer Greg Kurstin (Adele, Sia), collaborating with Sydney Opera House alumnus Matt Berninger of The National on “My Enemy”, and turning the personal towards the political. The result is “an urgent call for empathy in their poppiest record to date” (Noisey). Advocacy is not new to the band. Mayberry uses her platform to speak out against gender inequality in the music industry and cyber misogyny. In 2013, she penned a compelling and inspiring op-ed for The Guardian and has been considered a significant precursor to the #MeToo movement. 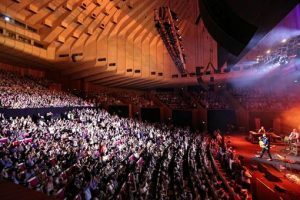 Now, returning to Australia this summer, don’t miss CHVRCHES’ magnetic, no holds barred debut performance on the Sydney Opera House Concert Hall stage.